Blogging about food and whatever since 2004. I took a supertaster test today, courtesy of Doug, who mailed some kits to the Serious Eats office to test the supertaster-ness of food bloggers. All you do is chew on a special strip. If it has no taste, you're a non-taster. If it's mildly bitter, you are a regular taster. If it's very bitter, you're a supertaster. I placed the tiny strip on my tongue. Waited. Chewed. And then the horror set in. Oh my god. Tasted like. Horror. HORROR. The bitterness of the strip lingered like the smell of a dead rat stuck in the roof of a long abandoned building covered with moss and mildew and death. And rats. Okay maybe not that bad. But I had to chase it with a spoonful of ice cream. SO THERE! Morten, Kåre and whoever else wonder about my malfunctioning coffee and alcohol tastebuds—there's my explanation. Although I am now officially a supertaster (which is not a very special title, as it applies to about 35% of American women), all this means to me is that bitter things taste more horribly than they should. It doesn't mean I can discern flavors any better than other people, as apparent through my inability to describe the taste of whatever I'm eating with vocabulary that extends beyond the eloquence of "AWESOME!" I failed. MID-DAY UPDATE! Ed just called someone at Jeffrey Steingarten headquarters to see if we could get HIM to take the taste test (he lives near our office, apparently). He wasn't available at the moment, but we've been told that he thinks the whole taste/supertaste thing is bunk and that supertasters are actually taste impaired. Now that does make sense in my situation. I SHALL NEVER ENJOY WINE, EVER. END OF DAY UPDATE! Adam made a video while taking the test. I'm not in it, but you can hear my voice...to the side. Indeed, Ed and I took a trip to Steingarten Central and I took a video of him talking about the meaninglessness of supertasting. Or normal tasting. I don't remember exactly what he said; Adam will post that online later. I was told in a wine appreciation class that the higher incidence of supertasting in women was the reason that women tend more towards white wine than red. And also that it's evolutionary thing - women were the preparers of food, and had to be more cognizant of the possibility of spoilage or poison. The more you know! Also, taste is linked to smell...since women (smell better?) have a better sense of smell, it only follows that their sense of taste would also be better. Yay! You're somewhat an official supertaster! I'm saying somewhat since I don't think this test, like Moffaen said, is infallible. When it comes to tests like the supertaster, *coughs* LSATs *coughs*, IQ tests, etc. can determine a person's taste superiority or intelligence but it doesn't have the complete picture of what that person's capabilities. Interesting but not necessarily meaningful. Sera: Glad you noticed that. ;D Let me know your results! I think even if I were a regular taster I still wouldn't like coffee. Penny: My sense of smell is...just alright, I think. It was much better when I was eating healthily though. Almost scarily so...when I was just eating raw food I remember being able to smell a lot of things. For better or worse. Tina: I think "super" is misleading. IF YOU'RE SUPER, YOU CAN TASTE BITTER CRAP! Yaay...aa? Being a supertaster sure doesn't make your memory bank of flavors any better. Or better at describing food. I feel like it all comes down to preference; if I liked bitter flavors, then being a supertaster would be awesome. Because bitterness would be amplified. But I hate bitterness. Hm. A couple years ago I went to a Umami dinner featuring Tim Hanni, a wine master from Napa. He asked people who like salty food to raise their hands (I love anchovies, herring etc) not pouring salt on my food. As he ask other questions and my hand remained raised. He said if you drink coffee and I say if, you would load it with sugar and cream. It seems I am "a super taster" ...I have more bitter receptors than most. What few wines I drink are usually sweet not dry and definitely not red. I don't do coffee, never have, can barely stand the smell. I was pleased to hear about this post tonight at a gathering of Baltimore food bloggers. It is nice to know I'm not the only one who doesn't like coffee and doesn't do wine (well rarely). And yes, I have a super snoot and at times it isn't a blessing. Oh, and not liking coffee is fine (more for me!). Kathy: YOU WILL JOIN US! Morten: I CHEWED ON A PIECE OF PAPER! I guess I need to describe it better...hm. Someone's already done that though, I know it. Just too lazy to look right now. You can have all the coffee, nooo problemo! I think its helpful to recall that having more taste buds (being a supertaster - if you will) goes well beyond a more acute perception of bitterness. The supertaster test uses bitterness as an easily quantifiable measurement tool to determine taster status. ...must get test to Tina. I took the same supertaster test, and I'm a supertaster as well. As we all know I love coffee, so there you go! 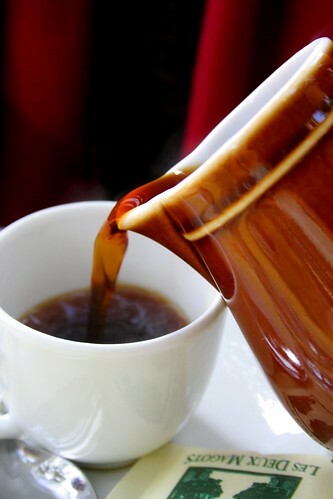 I love coffee but coffee without a delicious piece of bread is not a coffee because it gives a special flavor. \n\nI took a supertaster test today, courtesy of Doug, who mailed some kits to the Serious Eats office to test the supertaster-ness of food bloggers. All you do is chew on a special strip. If it has no taste, you're a non-taster. If it's mildly bitter, you are a regular taster. If it's very bitter, you're a supertaster.\n\nI placed the tiny strip on my tongue. Waited. Chewed. And then the horror set in. Oh my god. Tasted like. Horror. HORROR. The bitterness of the strip lingered like the smell of a dead rat stuck in the roof of a long abandoned building covered with moss and mildew and death. And rats.\n\nOkay maybe not that bad. But I had to chase it with a spoonful of ice cream. \n\n[licks inside of mouth]\n\nEuh.\n\nSO THERE! Morten, Kåre and whoever else wonder about my malfunctioning coffee and alcohol tastebuds—there's my explanation.\n\nAlthough I am now officially a supertaster (which is not a very special title, as it applies to about 35% of American women), all this means to me is that bitter things taste more horribly than they should. It doesn't mean I can discern flavors any better than other people, as apparent through my inability to describe the taste of whatever I'm eating with vocabulary that extends beyond the eloquence of \"AWESOME!\" I failed.\n\nMID-DAY UPDATE! Ed just called someone at Jeffrey Steingarten headquarters to see if we could get HIM to take the taste test (he lives near our office, apparently). He wasn't available at the moment, but we've been told that he thinks the whole taste/supertaste thing is bunk and that supertasters are actually taste impaired.\n\nNow that does make sense in my situation. I SHALL NEVER ENJOY WINE, EVER.\n\nI'll save some monies.\n\nEND OF DAY UPDATE! Adam made a video while taking the test. I'm not in it, but you can hear my voice...to the side.\n\nIndeed, Ed and I took a trip to Steingarten Central and I took a video of him talking about the meaninglessness of supertasting. Or normal tasting. I don't remember exactly what he said; Adam will post that online later. © Robyn Lee and The Girl Who Ate Everything, 2004-2018.